The best part of a birthday in April is waking to warm air, a cardinal’s song, the steady green growth of hostas uncoiling, lily leaves fanning, Japanese ferns unfurling. Brown earth comes alive with possibility—plantings and weeds alike, nature does not discriminate. Everything grows. I believe April inhabits my bones, the anticipation of light. All through winter, my body mimics the habit of bears. I hibernate— not in reality, for I go about my life, attend to the details, but I lack verve in waking. On dark, grey mornings, I drag. A week before daylight savings, the sun in the just-right ascension, a switch goes on. Bright mornings, I am up with energy. This day, I am in full spring mode, grateful to be alive, strong in body and mind, able to write. Writing is a privilege; it challenges, enhances, feeds my growth. I began to write in adolescence, when emotions poured and fueled my pen. Writing became my balm, a way to sort and sift my adolescent angst. The sheer effort of outpouring— poems, letters never sent—transformed and contained my feelings. I have always been grateful for my instinct to write. Mom went to business school and typed invoices for Dad. A large, black keyed Underwood typewriter sat on her desk; it was inviting. Around age eleven, I began to play at the typewriter much like I played piano— pushing the keys, enjoying the feel of something tangible emerging from my effort. Over time, I learned to type with two fingers just as I do now on my IMac. Two years ago, on my 82nd birthday, I made the decision to begin a gratitude diary. The impetus was emotional—the fact of aging, coming out of a tough winter, the myths and realities of potential vulnerabilities, wanting to evolve into a more creative and grounded lifestyle. My first entry, I wrote the story of my birthday trip to Weston Nursery in Hopkington, the starting place of the Boston Marathon, to replace two winter-damaged daphne plants with three spirea. “ It was a windy, cold, body-chilling day. The spirea plants were at the back of the property requiring a long walk in the rain. The woman waiting on me was reluctant in body and spirit— tired, worn down, as she described 8 years of work and the requirement to be present weekends and workdays all three growing seasons. She expressed little gratitude and I did not try to change her mind but listened with sympathy. “I have five spirea in an embankment at home,” she said. Her gratitude assured my choice. On this day in my garden, they flame anew. 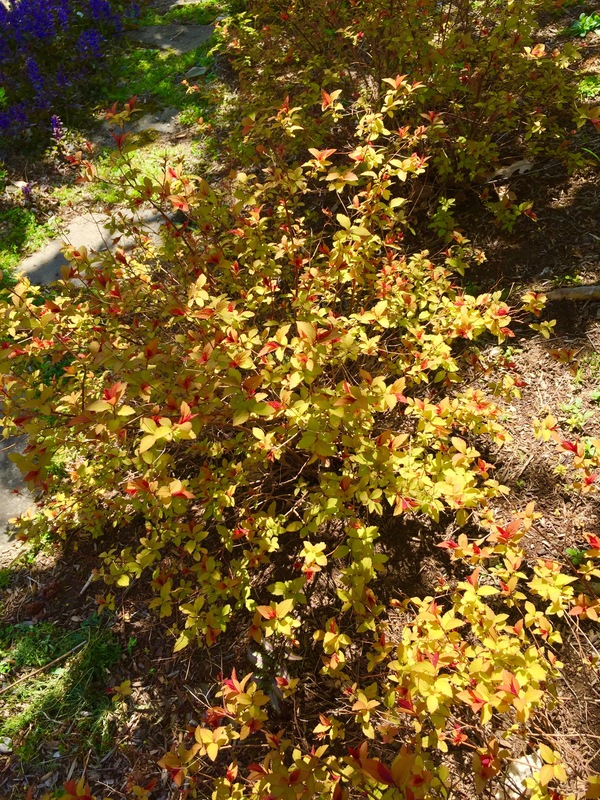 This entry was posted in Happiness, Mindfulness, Nature, Relationship(s), Sustainability, Uncategorized, Well-Being, Writing and tagged 84th Birthday, gratitude writing, spirea plants, spring light, writing as a balm on May 2, 2016 by fayewriter. Happy Birthday and may the day blossom and bloom open to the sunshine in side and out. Thanks for your sweet wishes, Sheila. Beautiful writing. Exquisite sensitivity to your surroundings. Hy, thanks, so much, for your kind comments. Happiest of birthday wishes. I need to replace some plants. But when to find the time? And where is that sun your wrote about? Carol, Thanks, so much. I’m glad you enjoyed the ending! Rosemary, Glad I gave the impression of tolerance….It occurred to me while weeding interminable dandelions last Monday— “Everything Grows,” especially when I refuse to use weed killers in my garden! Thanks you, Bev… always a pleasure to have you in my garden! Happy Birthday! Thanks for sharing your writing week after week. I look forward to your posts. Thanks, Heather. I appreciate your taking time to ackowledge and comment. Kat, I so appreciate your reading and responding to my blog. I can wrap my arms around the metaphor of my having a long growing season ahead of me. I’ll take it…I love your picture– all sparkles.